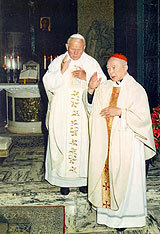 We welcome you to join us in Basilica of St John to pray for the persecuted church in China. 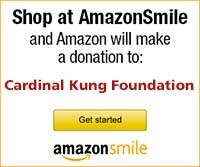 Any clergy who wishes to join at the sanctuary, please email cardinalkungfdn@cs.com. 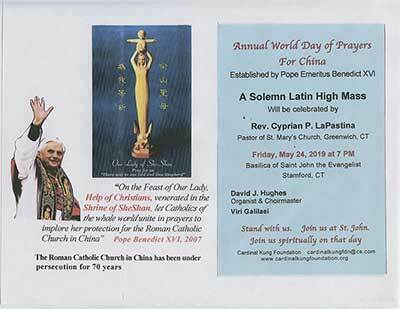 You can also offer your own Mass, request a Mass in your parish or attend a Mass around that day for China. China needs your prayers urgently. 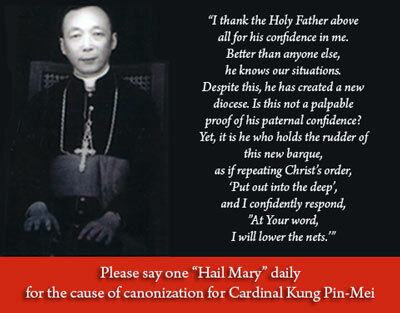 If a priest intend to offer a Mass for China in his parish/Chaplaincy, we will be pleased to send you a supply of the beautiful Our Lady Of Sheshan Prayer cards. Pope Emeritus Benedict XVI's Prayer to Our Lady of SheShan is printed at the back of this card. there will not be a resurrection. but there will be a resurrection." 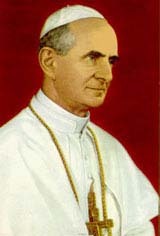 "We wish to manifest an earnest pledge of our solicitude towards you, as well as to accomplish a duty of veneration and gratitude...It is fire that tests gold; tribulation that proves saints; trials endured for Christ's sake being virtue to a summit of perfection, where like the Apostles, innocent of all malice, it endures wrongdoing while forgiving the malefactors...It is with these thoughts in mind that unceasingly we pray to our God of peace and all consolation that soon the dawn of peace may shine upon our beloved land of China, and that you may early be restored to the liberty fitting to your sacred position..."
"Your participation in Friday's Consistory was the realization of an intention which has been with me since the beginning of my Pontificate, since the Consistory of June 30, 1979. 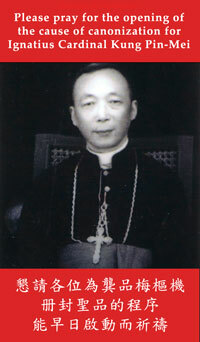 At that time, I felt that the whole Church could not but honor a man who has given witness by word and deed, through long suffering and trials, to what constitutes the essence of life in the Church: participation in the divine life through the apostolic faith and evangelical love. The bonds of faith, hope and love which unite the baptized with the Lord and with each other have an essential and visible manifestation in the communion which links the particular Churches to the Church of Rome and to the successor of Peter." "On the occasion of the seventieth anniversary of your priestly ordination, as you celebrate fifty years as a Bishop, and twenty as a Cardinal, it is a great honor for me to express my heartfelt congratulations and very best wishes. In your decades of fidelity to the Church, you have followed the example of Christ the Good Shepherd, and even in the face of great suffering, have not ceased to proclaim the truth of the Gospel by your words and example. For your faithful witness to Christ, the Church is deeply grateful."